The MultiSync Keyboard has all the qualities you’ve been looking for in a wireless Mac keyboard. Features include soft-touch keys, a rechargeable battery and the ability to connect up to 4 devices. Full-Sized Wireless Keyboard for MacThe MultiSync Mac Keyboard includes a full numeric keypad to easily enter numbers. Arrow keys are convenient for scrolling through documents and playing games. Easily access Search, Share, Device and Settings on your Mac or iOS device. Adjust the volume, play and pause with useful media keys. Use the Home, Back, Menu and Email keys on your iPhone, iPad or iPod. 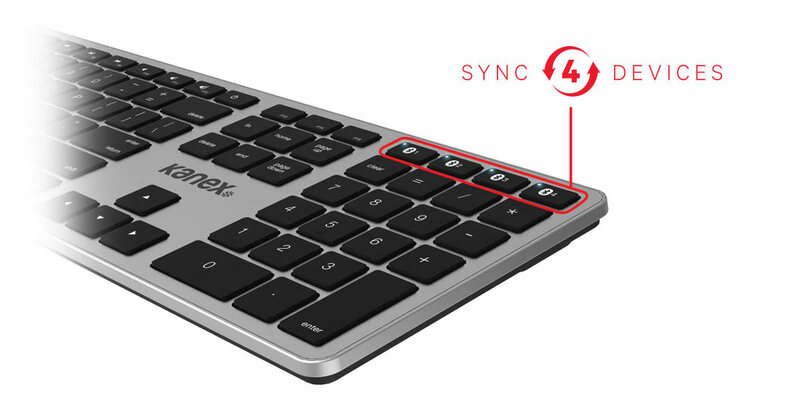 The Kanex MultiSync Keyboard’s built-in rechargeable lithium-ion battery has a 1,200mAh capacity, enough to keep you typing for 6 months. It comes with a micro-USB cable, so when you’re ready to charge, simply plug in to any wall adapter to power up. Easily check power levels with the touch of a button. An LED indicator will blink when the battery is low. Dimensions (L x W x H): 17.4 x 4.9 x 0.8 in.